The Toyota FCV keeps the fluidic side curves and pointed nose of the earlier concept. TOKYO -- Toyota said it plans to begin European and U.S. sales of its highly-anticipated FCV hydrogen fuel cell vehicle by the summer of 2015. 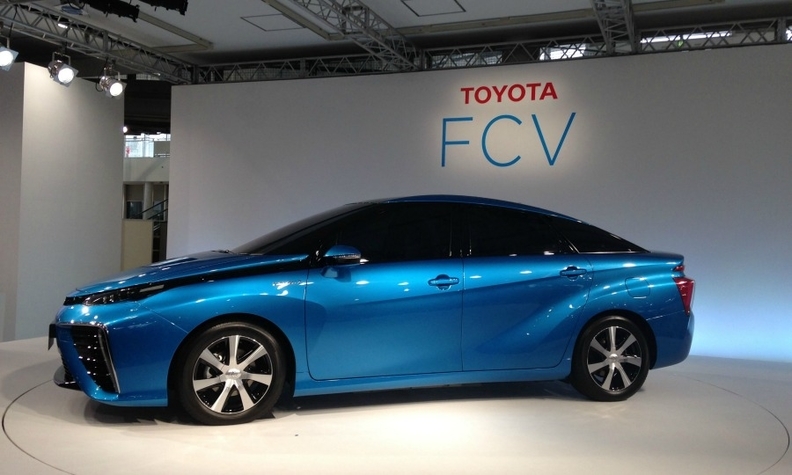 The FCV will debut in the Japan market by next April priced around 7 million yen ($69,348). Toyota today unveiled the production version's exterior design in Tokyo, showing an electric blue vehicle with only subtly toned-down styling from the dramatically curved concept with gaping front air intakes exhibited at the Tokyo auto show last fall. Toyota said the car will first go on sale in markets where the hydrogen refueling infrastructure is developed. It did not give details, but the company is already partnering to build a hydrogen pump network in California, where the car is seen as key to helping Toyota meet the state's stringent zero-emissions regulations. The Japanese price of $70,000 is higher than the low estimates dangled by Toyota last fall when it unveiled the concept. At the time, Satoshi Ogiso, managing officer in charge of alternative vehicles, said the company expected to cut the cost of producing the hydrogen fuel stack in half, allowing the vehicle to sell for between $50,000 and $100,000. Toyota Executive Vice President Mitsuhisa Kato, in charge of global r&d, declined to give pricing for the United States or Europe or volume targets. Sales of the vehicle, which will be manufactured in Japan, will partly depend on the level of government subsidies, he added. “Subsidies are very important, but levels of subsidies are still undecided,” Kato said. In the past, executives have hinted that the vehicle is expected to have total global sales of between 5,000 and 10,000 units. Those volume efficiencies would help reduce the cost of the fuel cell pack to just 5 percent of what it was less than a decade ago, Ogiso said. Toyota is joining Honda and Hyundai in introducing retail-ready fuel cell vehicles in California. Initial sales are expected to be modest. Hyundai started retail leasing of its hydrogen-powered Tucson crossover this month. Honda targets a 2015 launch. Hydrogen fuel cell vehicle hold great promise for reducing carbon dioxide emissions because they combine hydrogen and air in chemical process that produces electricity, with water vapor being the only “exhaust.” But limited refueling options and the cost of building hydrogen pumping stations limit the cars’ range and remain a big hurdle. By late last year, there were only 10 public hydrogen fueling stations in the United States, according to a U.S. Department of Energy database. But fuel companies are planning to build dozens more by 2015. And California has enacted a law to fund the construction of at least 100 public hydrogen fueling stations in the state by 2024. Japan has only 31 stations, either up and running or under construction. The government has said it aims to build 100 by April 2016, but roll out is running behind schedule. Kato said adoption could come quicker in Japan because the compact island nation makes for a denser network of fueling stations that may alleviate range anxiety. Still, Toyota is prioritizing fuel cell vehicles over battery-powered electric vehicles because it says they are better suited to long-range range driving. The production exterior shown June 25 varies slightly from the concept. It keeps the fluidic side curves to remind observers of its water vapor emissions and the pointed nose with wildly exaggerated side air intakes. Squinty headlines meld into a pop-up hood motif lending the look of a floating engine lid. A blacked-out c-pillar defines the rounded cabin. The four-seat vehicle rides on an all-new dedicated fuel cell platform. Toyota said June 25 its two high-pressure hydrogen tanks give it a range of 700 kilometers (435 miles). Kato said the goal is to deliver operating costs, including the cost of hydrogen fuel, on par with the company’s hybrid vehicles. A government environment minister at the June 25 event says the cost of building a hydrogen fueling station should be halved by 2020. The fuel cell stack is about half the size of the one used in Toyota's previous fuel cell vehicle, a modified Highlander crossover called the Toyota FCHV-adv that was introduced in 2008. It also uses fewer cells and a smaller motor to improve packaging and cut costs. Tanks storage density is improved by 20 percent over the FCHV-adv. The stack delivers output power over 100 kilowatts, at a power density ratio twice that of the FCHV-adv. Speaking at the June 25 Tokyo unveiling, Ogiso declined to say what kind of battery the FCV will use. But he said engineers cut costs by using components from Toyota’s hybrid vehicles, including the battery, motor and control unit. That indicates Toyota may stick with its tried-and-true nickel-metal hydride batteries, instead of leaping to lithium ion ones.